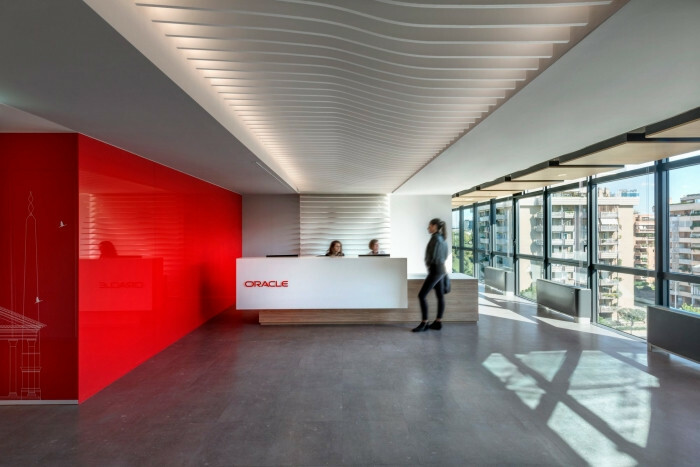 A cloud of dynamism and innovation, of comfort and sense of welcome, of sharing and collaboration, of solidity and leadership, of technology, sobriety and freshness, and also of Italianness: these are the key words that characterize the spaces of the new Oracle Italia headquarters in Rome . And it is the cloud, the Cloud , the main concept that summarizes the general sense of the whole project, with its values ​​of lightness, accessibility and speed. The new Oracle Italia headquarters is located in the EUR district, in a business district full of history and constantly evolving, alive and full of facilities for leisure, shopping, culture and fitness. The building is a multi-tenant, of which Oracle Italia occupies four floors (from the 3rd to the 6th), with a rectangular plan with two large internal patios on the sides of the central core, which collects vertical connections and toilets, and a “satellite” body ” connected. Approximately 6,000 square meters of surface redesigned by a tailor-made project tailored to the organization, the peculiarities of the teams and the needs of the people: a smart project that makes the work-life balance a primary objective, without delegating it to the wealth of external services offered by the district but integrating that wealth within its spaces with great attention to the staff. At 239 standard workstations , fitted with height-adjustable desks and ergonomic operational chairs (supported by lockers with different digital combinations depending on the type of station, assigned or shared), they are accompanied by spaces as the drop-in space, ideal as a workstation temporary for colleagues on other floors and / or other locations, and a rich articulation of collaborative areas : from open spaces for team activities or one-to-one meetings with various types of furniture, to over 50 differentiated environments classic meeting rooms (including 7 reconfigurable), video conference rooms, phone booth, demo room and huddle room (the latter alternatives to the classic meeting rooms, set up with small armchairs and small support tables for simple and informal meetings with clients or colleagues). Complete the picture multifunctional environments freer from use patterns, such as lounge areas along the terraces of the 5th floor, break areas (on each floor) and the Customer Visit Center to which the 6th floor spaces are entirely dedicated: designed according to flexibility criteria, equipped with reconfigurable meeting rooms (with a capacity of up to 90 seats) and catering spaces reserved for the preparation of coffee breaks and buffet lunches, it is a large representative space where guests, customers and partners can take part in more unstructured events, conferences or meetings on the terraces.